There has been an enormous level of potential attached to Kaia Kater. Although, it is the release of her latest album GRENADES that will see the seam most productively tapped. This album (Kater’s fourth) is having a staggered release across her target territories, with it taking a UK bow on January 11th after initially beginning life across the pond in the latter months of 2018. The vagueness of ‘across the pond’ is pertinent in this context as it portrays a Canadian artist heavily schooled in old time American music exploring their very own Caribbean roots. The multiple facets that adorn this record make it one of the most interesting releases discovered in a while, providing an abundance of thoughtful moments across a soundtrack that amply rewards an open-minded approach. For the record, GRENADES consists of eleven songs and three spoken interludes drawing inspiration from the island of Grenada; the home of Kater’s father who fled the country in the 1980s in the aftermath of political upheaval and subsequent US invasion. While the music will ultimately claim the spotlight, the three spoken parts delivered by her father and strategically placed at track numbers: 4, 8 and 13 add an atmospheric element to splice the album with traces of documented history. For folks previously aligning Kater’s work with the banjo, the reduction of its impact will be instantly noticeable without a move too far away from a roots base. One interesting addition to the sound is the work of fellow Canadian Christine Bougie, whose twang laden input has enhanced artists such as Good Lovelies, Bahamas and, more relevant for fans in the UK via a previous key member of Gretchen Peters’ touring band. This sound, presumably from lap steel, is subtle yet detectable and threads throughout the album starting in the opening track ‘New Colossus’. The writing input strengthens this side of Kaia Kater’s armoury. Only on ‘La Misère’ does she dip into the archives, and the impact of this short track lies in its language delve into some French dialect. Elsewhere apart from the exquisite storytelling, the ability for a continuous array of strong chorus melodies to emerge smooths the way for the album’s sonic capabilities to take hold. Even in the first half of the forty-three minutes playing time, this feature has lauded the reception of tracks such as the aforementioned opening one, ‘Canyon Land’ and ‘Meridian Ground’. If the spoken parts achieve one thing, they will surely create a curiosity to dip back into the history books and learn more about the circumstances surrounding Grenada and ultimately the aggressive side of US foreign policy at the height of the Cold War. These spoken parts chronicle the optimism of change, the horror of invasion and the ultimate re-settlement. 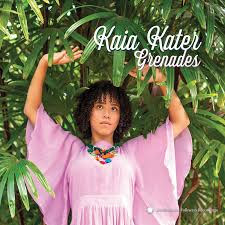 The personal element provokes thought and supplies the intent that has led to Kaia Kater making GRENADES. Further fascinating content emerges in the second half. ‘Hydrants’ sees all instruments ditched for a Capella delivery, while the banjo re-appears to support the penultimate song ‘The Right One’. Title track ‘Grenades’ is a worthy candidate for stand-out number in the latter stages with its shimmering organ play out ending the song on a high. To dismiss any lingering doubt about this album being a compelling listen, ‘Poets Be Buried’ seals the deal in a stunning heartfelt finale that urges further delving rather than closing the book. From a personal perspective, GRENADES moves the game a lot further forward than its predecessor NINE PINS, the release that accompanied Kaia Kater on her recent tilt at the UK market. It was unsurprising that Rhiannon Giddens had played a significant part at the outset of Kater’s overseas touring career including offering opening slots, and an invitation to join the Cambridge Folk Festival curation. 2019 sees Kaia Kater return to play shows in the late spring and this time equipped with such a strong new album that the potential tag can be finally removed. A record that will prosper further in a live setting. So kick-start your New Year listening by allowing this album to educate and entertain you.